In today's toxic world, people are being exposed to and increasingly inhaling large volumes of dust, mold, bacteria and Volatile Organic Chemicals. These hazards are everywhere - on our keyboards, phones and in the air - and continued exposure is making us sick. 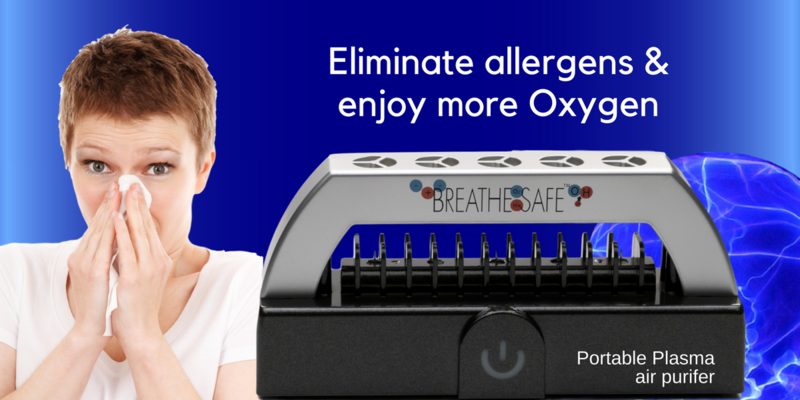 The Breathe Safe is a compact and portable plasma air cleaner and air purification device that quickly attacks these miniature health hazards - reducing or eliminating them from just about any personal space - while adding 70-118% more oxygen, depending on background oxygen levels, in as little as 5 minutes. Remaining indoors, aging and a sedentary lifestyle means lowered oxygen levels of up to 20% in the body. With the added boost of oxygen from the Breathe Safe you can easily increase the effectiveness of breath work and breathing exercises to quickly fix low oxygen levels. The Breathe Safe is also a plasma generator. Plasma reduces the body’s stress response caused by exposure to harmful chemicals and organisms, and gives the body the needed oxygen to detoxify. This quiet air cleaner quickly and naturally lightens the daily toxic load that is placed on the human body with every breath - without creating worse hazards like super bugs. The Breathe Safe Personal Space portable plasma air purifier and oxygen booster is an ion generator that releases a large invisible cloud of both negative and positive ions in nature's healthiest proportions. This ionic process releases energy that reduces volatile organic chemicals and compounds, particulates, spores, odors and dust mites. By generating 23,450,000 of the right ratio of ions per cubic centimeter, the Breathe Safe additionally helps neutralize bacteria, viruses, and fungus. It does so by repeatedly robbing hydrogen molecules from pathogen protein surfaces, without creating resistance or harmful mutations. The Breathe Safe can also be used with the Sauna Fix® near infrared sauna or inside an existing home sauna. The Breathe Safe is both safe and efficient for operating inside sauna enclosures, and studies show that the presence of negative ions during a sauna session enhances the near infrared light therapy benefits by as much as 300%. Laboratory test results show that an individual operating the Breathe Safe™ inside a 3 m³ test chamber (slightly larger than the radiant Sauna Tent) for 30 minutes at a 100 cm distance, would take in 56,000 negative ions per cm3. This makes it an exceptionally powerful negative ion addition to any home sauna.The Breathe Safe is compact for easy portability and can be powered using a USB outlet, a wall outlet of any voltage, or a car cigarette lighter to purify the air in your car on the go. The Breathe Safe consumes only 2 watts of power, is lightweight (11.1 oz), and easy to maintain - all while producing a tremendously high ion output, and is CE and ROHS certified. View the Breathe Safe's laboratory test results, VOCs test results, and particles test results.